I had so much fun embossing metal with my Vintaj embossing plates that I decided to make a few more pieces of jewelry. First the feather was glued into a connector cap. The embossed leaf was then attached to a small jump ring and the shell bead placed on a head pin. All the findings used were from Ben Franklin Crafts. A large jump ring was used to attach the feather, shell bead and embossed leaf to the turquoise leather cord. Finally, a cord connector was crimped onto each end of the leather cord and a clasp attached to one end and the clasp loop fastened to the other side. 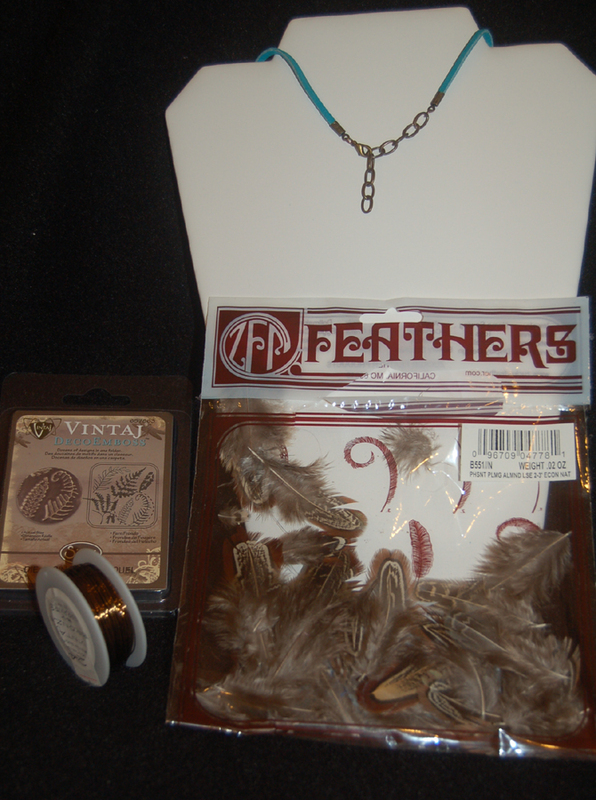 With all the pretty feathers and intricate Vintaj embossing plates available at BFC, I know that YOU can make a piece of jewelry like this with very little effort and time. Give it a try and don't forget to make a pair of matching earrings like the ones I posted previously. Have a crafty day! Originally, I was just going to use the 'Thank You' pop-up die to make a generic thank you card, but then I started to wonder if there was anyone who I haven't thanked recently. The first person who came into my mind was my husband; then I realized we have an anniversary coming up. When I spied the black and white Studio 112 stickers that had just the right sentiments, I knew that it was a sign that this thank you card would become my anniversary card to my sweetie who always seems to go out of his way to make sure that I am happy and comfortable. I constructed the card in much the same way that I did the pop-up card in my last post except that I used Authentic double sided card stock. On the front of the card I was just going to cut out a rectangle from the striped card stock and then I noticed that there was a proverb on the bottom next to the maker's label. 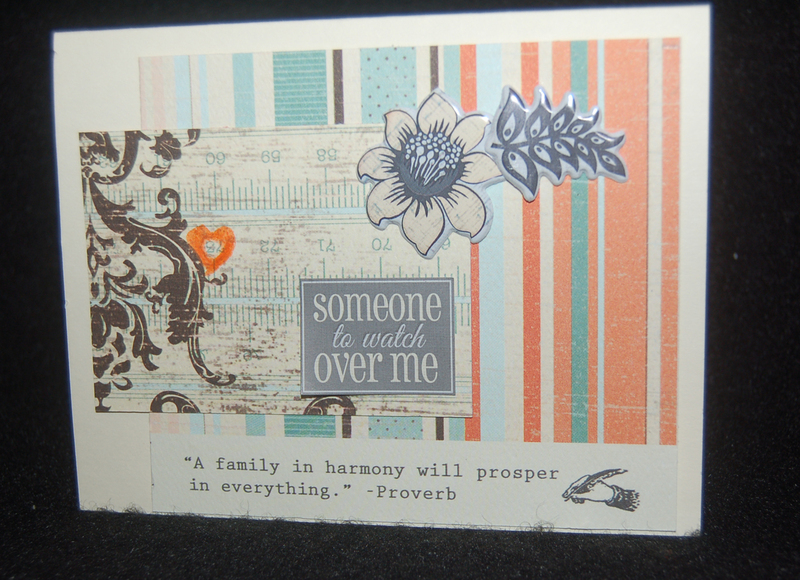 Since the proverb fit the general tone of the card, I included it on the rather casual layout of the card front which includes Studio 112 flower and leaf stickers plus another Authentic card stock. (There is even a secret number in the heart which has significance for our anniversary. I found it by accident within the measuring tape design on the card stock and it was in just the right spot......serendipity!) All of the materials and dies used for this card were purchased at Ben Franklin Crafts. I hope that you will check out the 'cool' craft tools and amazing craft supplies at a BFC store nearest you. (There are stores on Oahu, Maui, Kauai and the Big Island.) 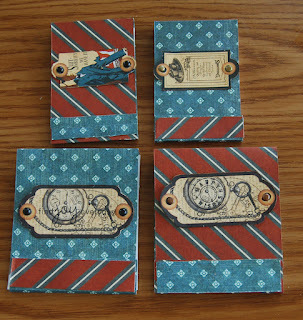 Thanks for visiting my blog and I hope you find some time to do a little crafting this weekend. Ever since I saw the Joy of Crafting episode showing the new pop-up word dies, I've been waiting anxiously for them to get to Ben Franklin Crafts. 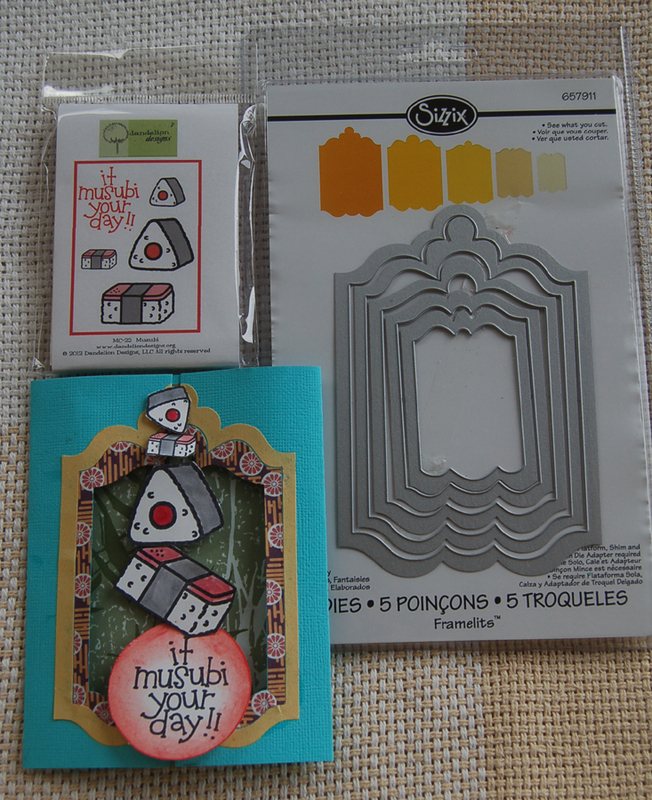 They finally made it to the Hilo store and I was so excited that I bought lots of the different pop-up die inserts and forgot to buy the die set that had the card base. LOL! 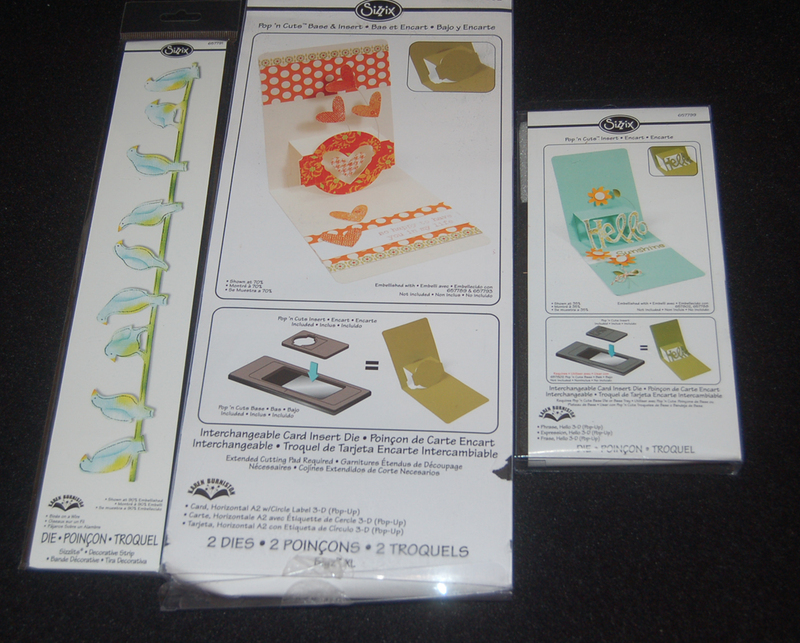 (Be sure you look carefully and buy what you need to create a pop-up card.) 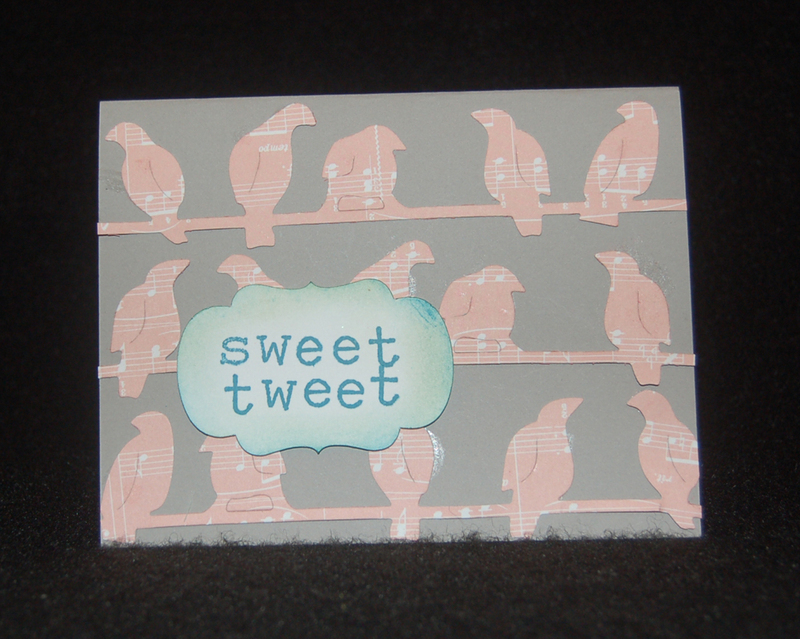 Anyway, the first card I'm showing you is one I made using the "Hello" insert Sizzix die, the pop-up card base die, and the 'Birds on a Wire' Sizzlet strip die. 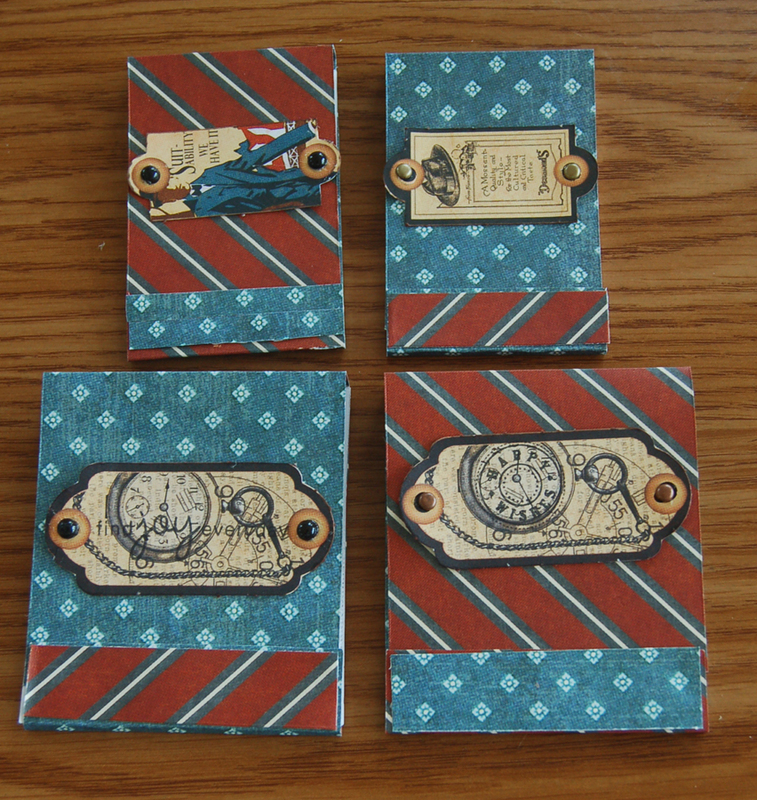 The card stock that I used were American Crafts double-sided ones (from my scrap bin). 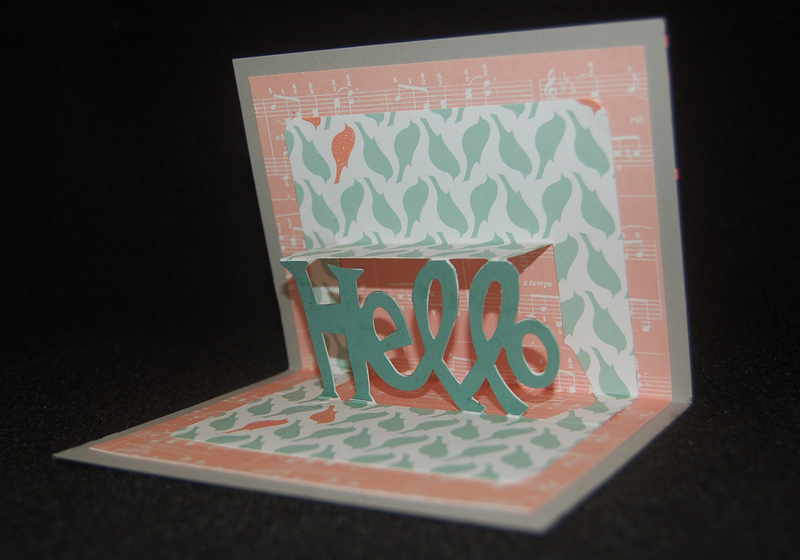 I discovered that the pop-up interior part of the card did not fit my 4-1/4" x 5-1/2" card blank so I cut off the extra from the top and rounded the corners with a corner punch. Also the popped out word 'Hello' was not easily read so I die cut just the word from solid blue paper and glued it over the 'Hello' before the whole piece was taped into the card. 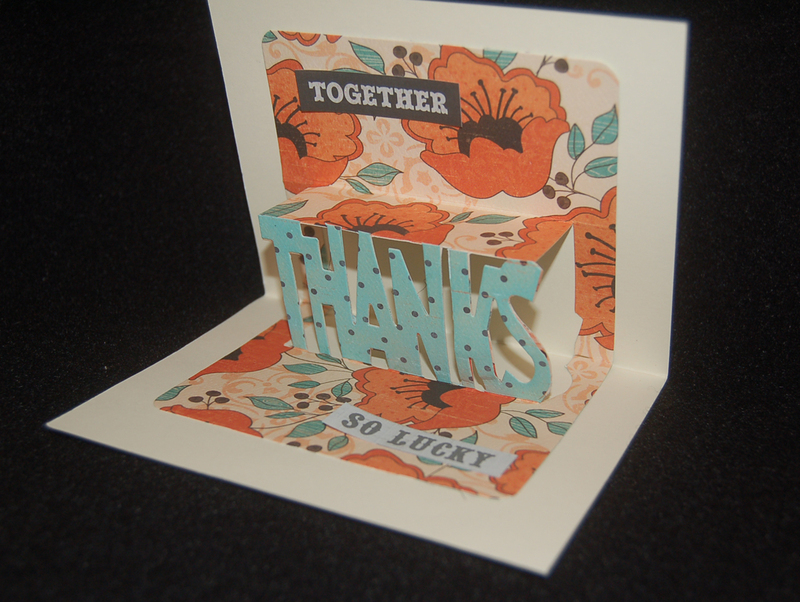 Because this was the first card I made with the new dies, it took me awhile to figure it all out, but I was very satisfied with the results. 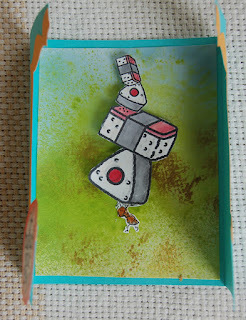 In fact, I immediately began another pop-up card. Visit this blog site again to see how it came out. Crafting keeps you healthy.....REALLY! 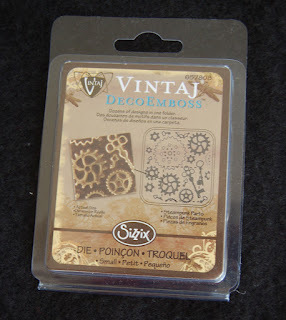 This is a beginner project for someone who has never tried the Vintaj embossing plates or someone who just loves the steampunk look...like me! 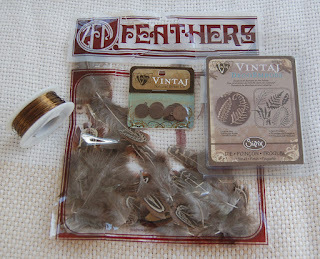 First start with the Vintaj embossing plate with the gear/key design (available at Ben Franklin Crafts). Place the drilled metal Vintaj tag into the embosssing plate and run it through any die-cutting/embossing machine (like the Big Shot) making sure you have the correct thickness to give adequate pressure. 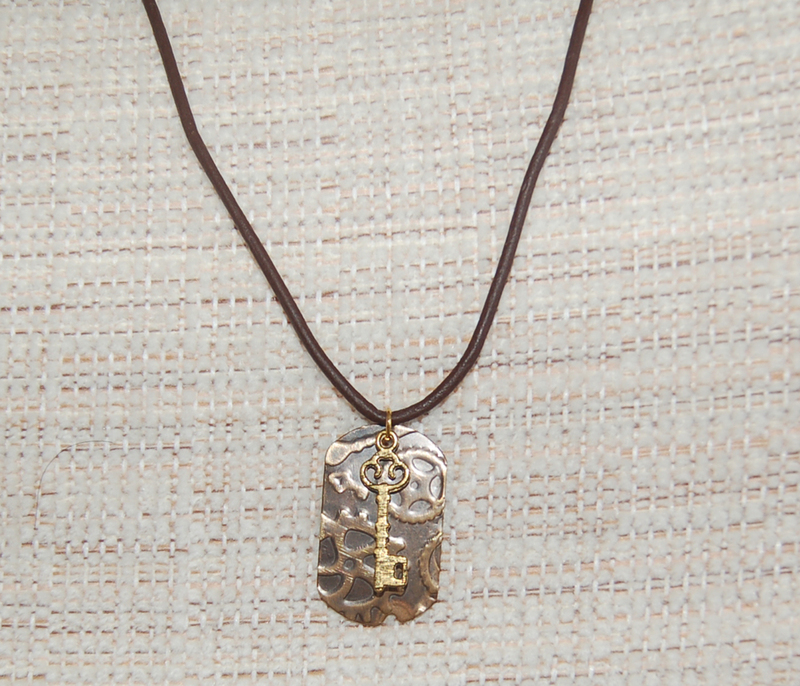 Once you achieve an embossed design, lightly sand the piece to add highlights. Use a jump ring to attach a key charm and the embossed steampunk tag onto a leather (or faux leather) cord (lots of choices at BFC). 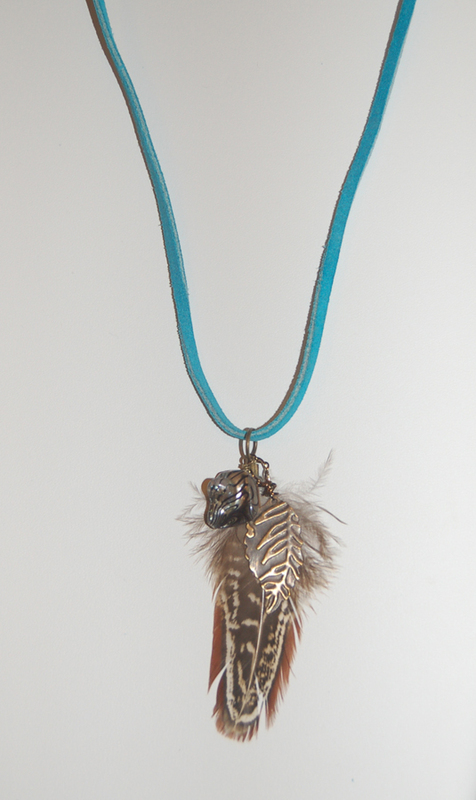 To make the necklace adjustable, overlap the cord ends and tie each end to the other side with a simple knot. Use a drop of jeweler's glue (from BFC) on each knot to secure, making sure that the knots still slide and then trim the cord ends. Simple right? Try it; you'll love it! 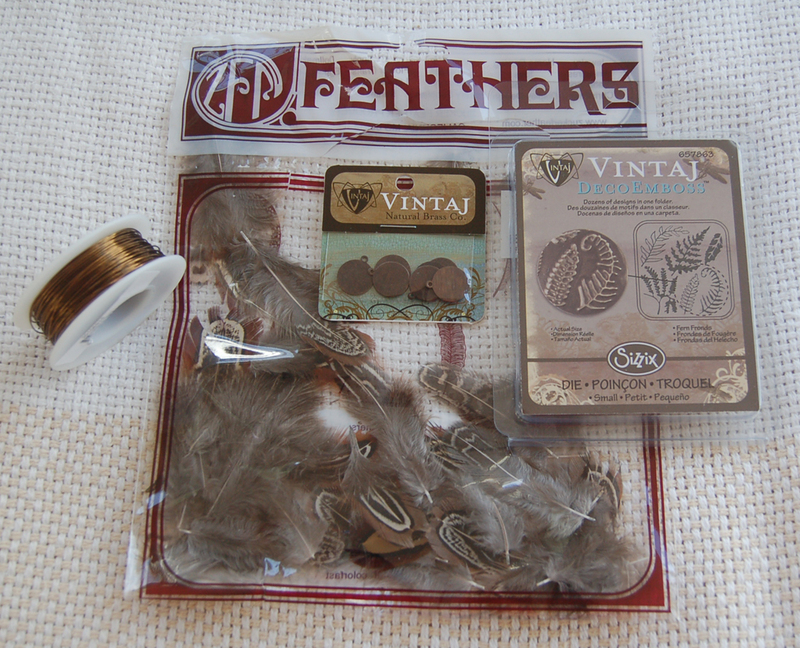 I had a surprise today when I looked at the Ben Franklin Crafts 'Ideas and Inspirations" blog and saw that Puna of the Enchanted Lakes store was featuring feathers in her post about making earrings. 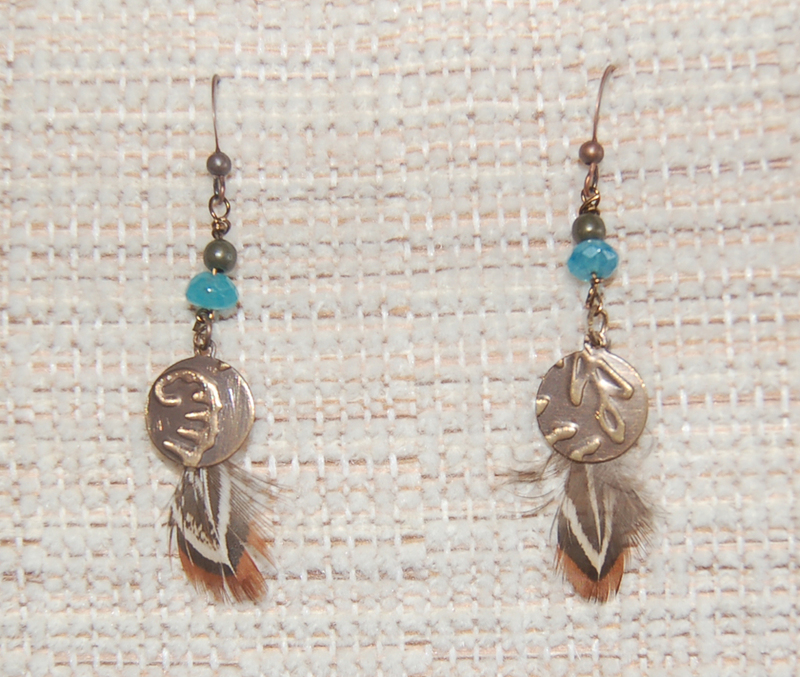 I just finished a pair of earrings yesterday and YES, I incorporated feathers in it, too. The basic focus of my earrings was to spotlight the Vintaj metal embossing plates. By simply inserting a Vintaj circle (or any shape) metal drilled disk into a patterned Vintaj embossing plate and running it through a regular die-cutting/embossing machine, the piece emerges with a pretty embossed design. Once a metal piece is embossed it can be lightly sanded to bring out the design or Vintaj enamel paints can be applied to the piece to add some color. I wish that I had read Puna's blog before I made my earrings because then I would have known to use connecting crimp ends to attach the feathers. 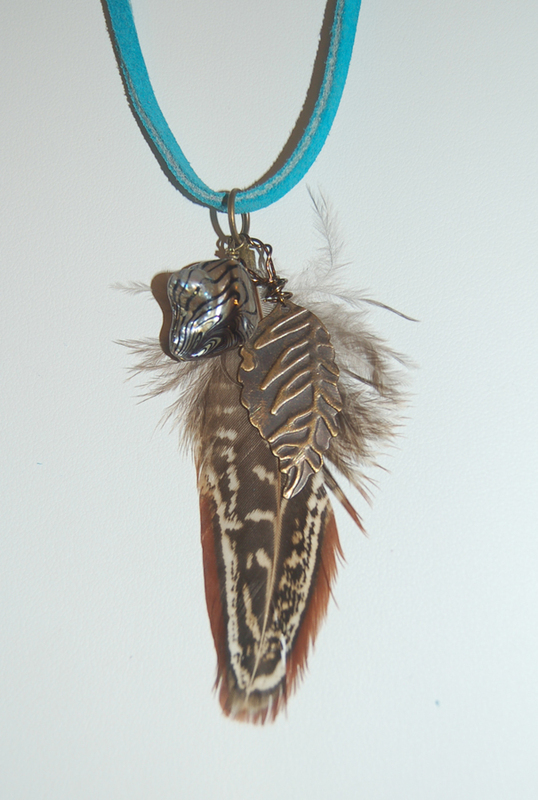 (I used regular crimps and glued the feather onto a piece of wire before crimping.) The little blue bead I used was an angelite semi-precious gemstone, but you can use any small bead that you can purchase from Ben Franklin Crafts. 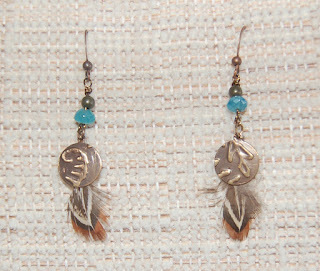 Choosing the feathers, embossing plate design, and beads will probably take you longer than making these earrings. They are super easy. I hope you'll try this fun jewelry project soon. Happy Crafting! 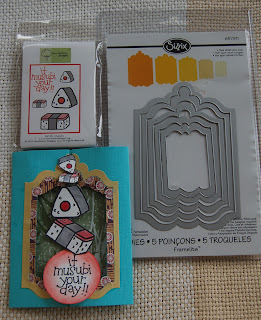 I think I saw this idea on Shirl's blog site and loved how she used the thin Sizzix dies to cut a window in a gate fold card. 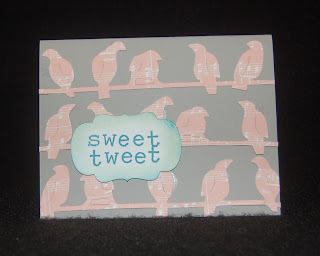 I used a shape from a Sizzix thin die set of tags (see photo). The borders around the opening were cut from the same great set. 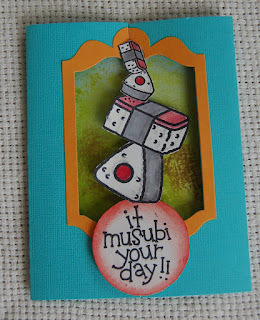 Using the Dandelion Designs musubi stamp set I printed the words and images. I punched out the words and cut out the musubis that I colored with Copic pens. 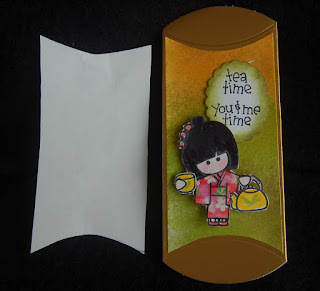 The circle with words was attached to one side of the card and placed so that it would slip under the bottom musubi . 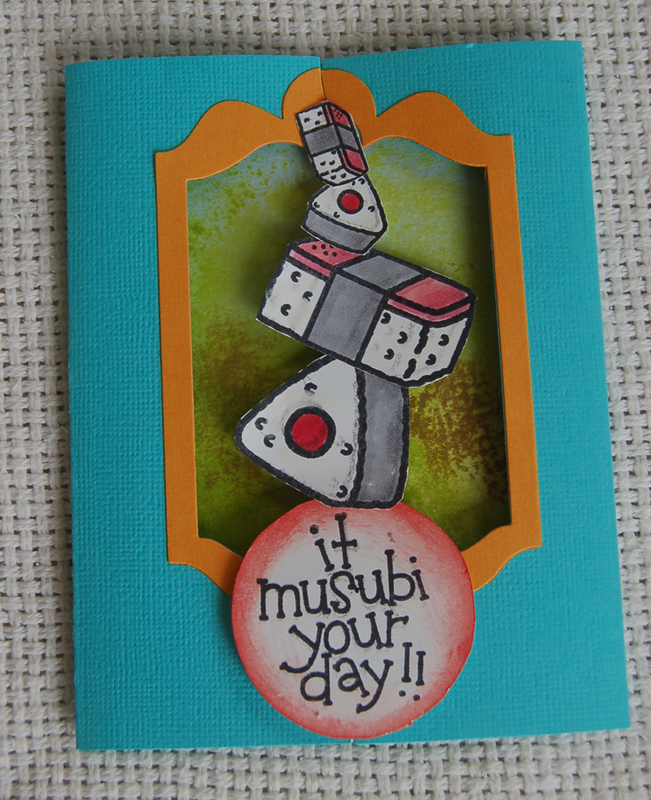 The musubi were all attached with pop dots to a watercolored background. 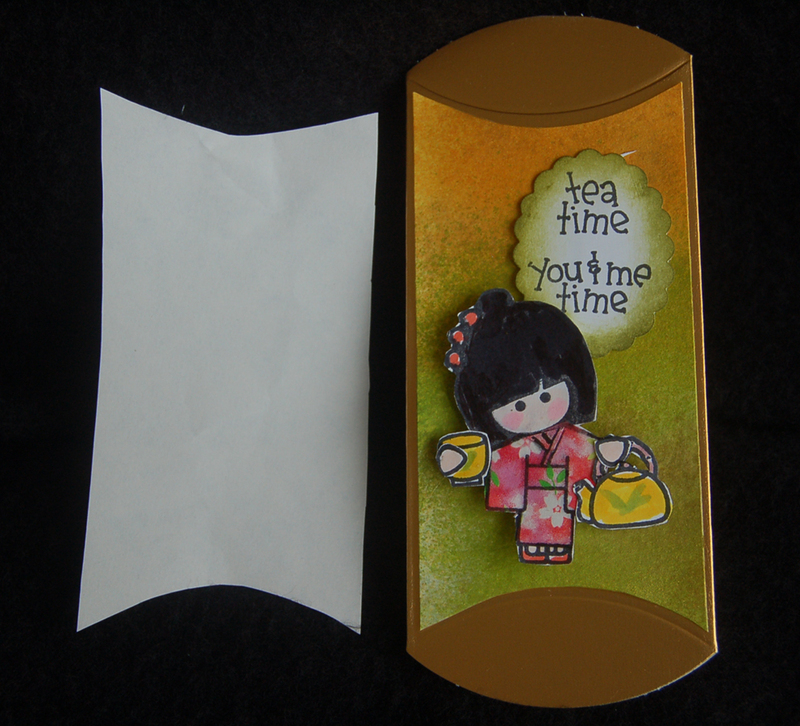 (The second sample card has Japanese print paper from the Celebrations store.) The top musubi was attached so that it would hold the top of the gate closed. The ant image is from a very old wood handle stamp (the ant was carrying a slice of watermelon) in my stash, but I'm sure you can find another one or perhaps a mouse will do. Anyway, I thought that this card would make a humorous birthday card, a little different from the usual flowery kind. I hope you enjoyed your stop here and please visit this blog site again. I've been experimenting with Mister Huey's spray inks on watercolor paper and the results have been interesting. When I used the gold ink, the washes of color had a certain Asian feel to them. At the same time I was rearranging craft supplies and 'found' some gold pillow boxes I purchased for ahhh...Valentine's Day. LOL! Anyway I decided to combine the boxes with the ink sprayed (on wet paper) watercolor paper. 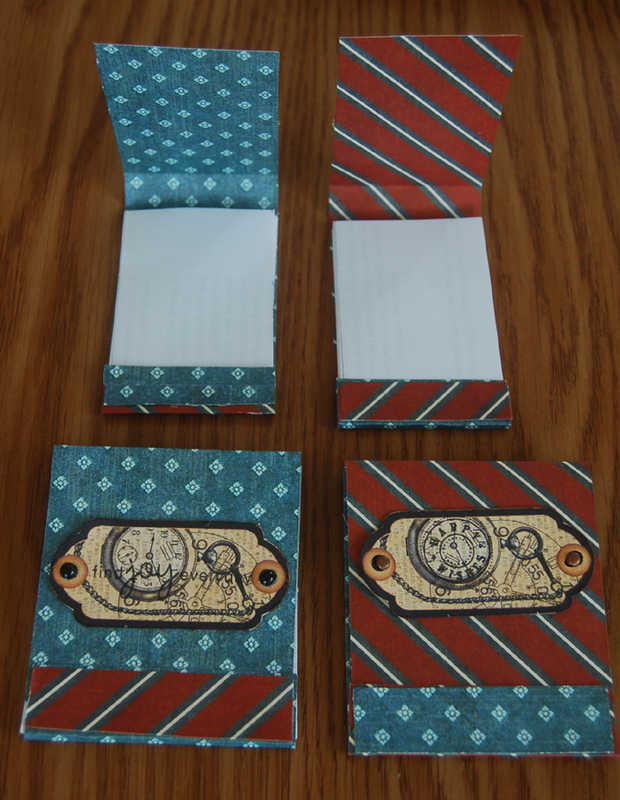 I traced around the folded boxes to make a template for the watercolor paper so I could make more decorated boxes later. The template is slightly smaller than the box front. Because I had the new Dandelion Design tea time stamp set out, it inspired me to use the image. It was a snap to color as I paper pieced the kimono with origami paper. The cut out image was raised up on pop dots. 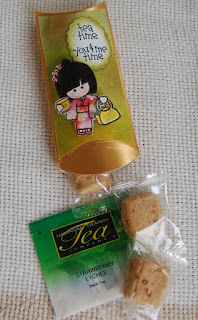 The finished project was simple because the golden pillow box was purchased (several in one package) at Ben Franklin Crafts (probably available at the Mapunapuna Celebrations store too). 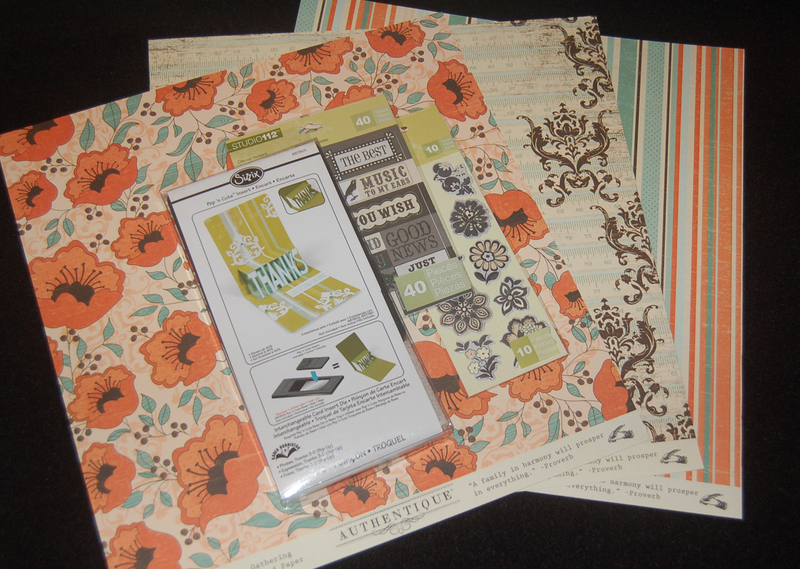 The Dandelion Design rubber stamps are from BFC too as were the Mister Huey spray inks. 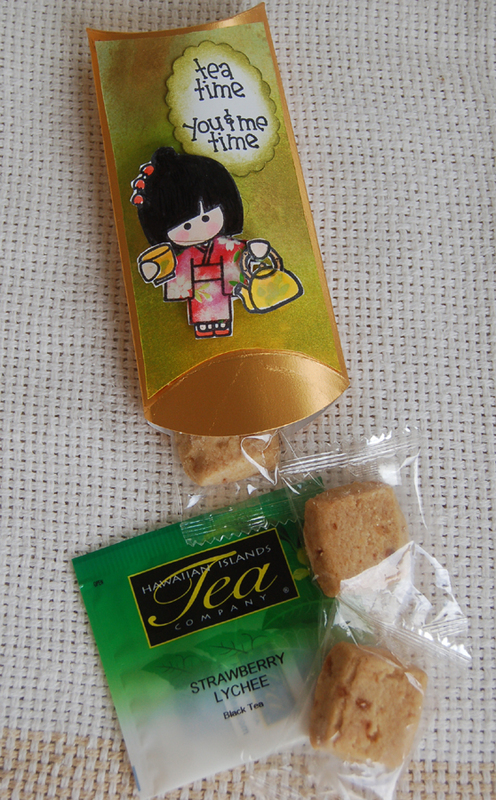 Giving a party favor like this would be delightful at your next tea party or bridal shower. Thank you for visiting this site. 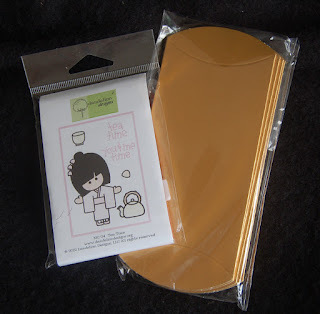 When my husband saw the matchbook scratch pads that I posted on my July 26th blog post, he hinted that he wouldn't mind having some of them (probably to use for my honey-can-you-bring-home lists) to keep handy in his briefcase. Of course I couldn't give him the girly-girl ones so I made these manly-man mini scratch pads from Studio 45 double sided card stock. These used only one 12x12 sheet and the labels came with the package of masculine card stock which made these super fast to construct. I did stamp 'secret' messages on the labels of the bigger matchbooks and used real brads on two scratch pads and half round black acrylic beads (from Ben Franklin Crafts floral department) on the other two. The staples were covered with the card stock scraps so nothing went to waste. My sweet and generous hubby gave me a Smart Phone for my anniversary (but I think I need one called the ''Dumb Phone' as that is more appropriate for someone with my lack of technical skills)......so I told him these matchbook notepads are my anniversary gift to him.....cheap yeah? Just kidding honey. Well, that's it for this post.....remember to craft something for someone you care about.